CHICAGO (WLS) -- A popular northwest Indiana pastor admitted in a Facebook post that he tried to go through Midway Airport security with a loaded semi-automatic pistol and spare ammo. Sieon Roberts, 35, pastor of the New Hope Missionary Baptist Church in Gary, Ind., was arrested by Chicago police around 5 a.m. on Monday. U.S. Transportation Security Administration officers noticed a gun in Roberts' carry-on bag as it was X-rayed at a Midway passenger screening station. He was heading to LaGuardia Airport in New York. The Facebook post made Tuesday under Sieon Roberts Ministries suggests Roberts was too tired to know the gun was in his bag. On Monday, the ABC7 I-Team left numerous messages for Pastor Roberts and spoke with his mother, who said she would have him contact us. He did not return the calls, but has now posted a statement on his personal Facebook page. 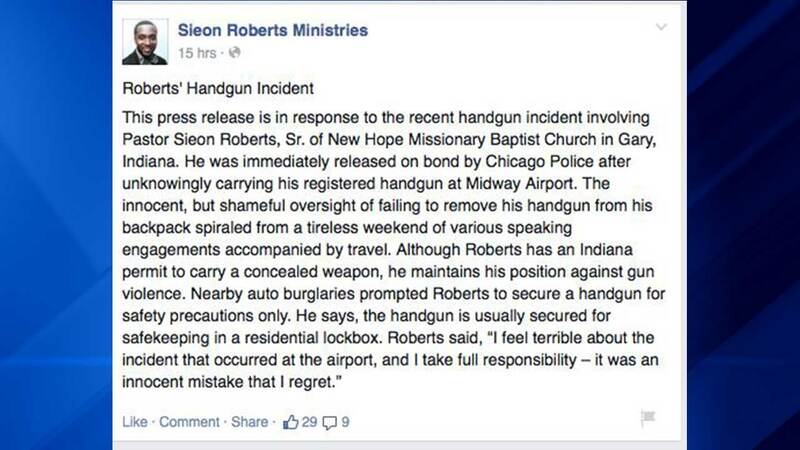 Roberts, a peace activist and leader of a Christian ministry in his own name, says that he "unknowingly" carried the 9mm Taurus pistol and 10 bullets to Midway Airport. One of the rounds was chambered, according to police. "The innocent, but shameful oversight of failing to remove his handgun from his backpack spiraled from a tireless weekend of various speaking engagements accompanied by travel" is how the mostly third-person statement on Facebook reads. Although Roberts has an Indiana concealed carry permit, he contends that the handgun is usually "secured for safekeeping in a residential lockbox," according to the post. How it ended up in his carry on bag, with ammunition, is not explained in the statement, which adds that the married father of four "maintains his position against gun violence." According to the Facebook post, "nearby auto burglaries prompted Roberts to secure a handgun for safety precautions only." In the Facebook post Roberts is quoted as saying, "I feel terrible about the incident that occurred at the airport, and I take full responsibility - it was an innocent mistake that I regret." He faces a single misdemeanor charge of carrying a concealed firearm at the airport and was released on personal recognizance bond. A Chicago court appearance is scheduled for April. While seizing a gun from a church pastor may be unusual, it is increasingly common for firearms to turn up on airport X-ray belts. More than 2,000 firearms were seized in 2014 by TSA officials at US airport checkpoints. The Monday morning gun seizure was the sixth so far this year at Midway Airport, according to TSA. That is the total number of guns found at Chicago's South Side airport in all of 2014. Twenty guns were discovered by federal screeners at O'Hare in 2014. Guns and ammo are banned from carry-on luggage but they can legally be transported in checked luggage if travelers declare them to airline employees upon arrival at the airport.